So what are the COLLATION & CHARSET supported by MySQL versions lower than 5.5.3? Fix Unknown collation utf8mb4_unicode_ci & utf8mb4 character set errors? Do you get an error Unknown collation utf8mb4_unicode_ci while migrating your WordPress database? No worries, this tutorial will explain how to fix both utf8mb4_unicode_ci collation & utf8mb4 character set errors. Before we see the fix, let’s understand the reason for the error and few snapshots. If you export WordPress database from MySQL server version 5.5.3+ and import into a MySQL server lower than version 5.5.3, then you are likely to see the below errors. Here’s the table structure which uses utf8mb4_unicode_ci collation and utf8mb4 character set. The above table structure is just one of the table in the exported SQL dump. There might be many tables using these collation & charsets. So MySQL version mismatch is the issue? Well, you got it, that’s exactly I was trying to explain. Because, the exported SQL dump file contains references for COLLATION set to utf8mb4_unicode_ci and CHARSET set to utf8mb4. The MySQL versions < 5.5.3 support utf8_general_ci collation & utf8_unicode_ci collations and charsets ‘utf8’. 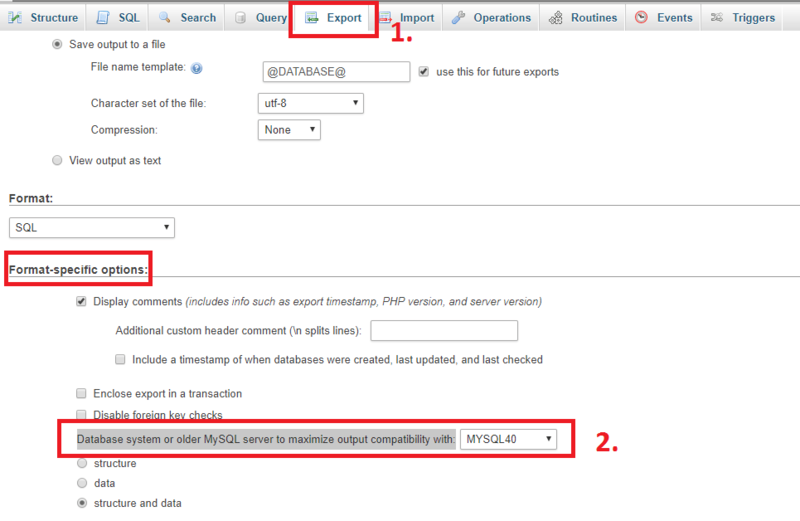 Follow the below steps to export SQL file with the compatibility for lower versions of MySQL. Lookout for ‘Database system or older MySQL server to maximize output compatibility with:‘ drop down & select “MYSQL40” option. Now click “Go” to export. Use ‘–compatible‘ option for mysqldump command as shown below. Import it into a lower version of MySQL and it should work. You can quickly open the exported SQL file in your favorite editor and replace utf8mb4_unicode_ci to utf8_general_ci & “utf8mb4” to “utf8”. Save the file and try importing.